Plenty of water is vital for healthy growth and cropping. When a plant goes short of water it stops growing and often starts to go to seed prematurely (bolting) - or just dies. For healthy, strong growth and the highest yields of the best crops your plants will need a constant supply of water at the roots. As a result, watering in summer is often necessary. Plants growing in containers are almost totally dependent on you to supply water, and you may have to water some container crops once or even twice a day in summer to prevent them drying out. 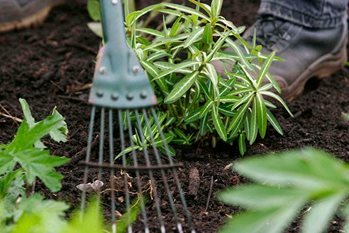 The aim should be to keep the soil or compost evenly moist - soaking dry soil can result in some crops splitting and becoming unusable. Seeds and seedlings are the most critical stages for many plants, so make sure seed beds and seeds sown in containers are kept moist while plants are establishing. Always use fresh tapwater for this, for water stored in waterbutts may contain pathogens (such as germs and bacteria) that could affect seedling growth. Some crops - such as the greenhouse crops and runner beans - and most seedlings will suffer a shock if watered with cold water, so allow it to reach ambient temperature before using. If water is in short supply then use it on the following crops: peas, beans and sweet corn when they are in flower; potatoes when they are producing their new tubers; large, leafy crops before they start to wilt. To get the most from your crops you will need to provide a constant supply of nutrients. Adding compost and even well-rotted manure to the soil will only add small amounts nutrients; they are mainly used to improve soil structure. Feeding with a fertiliser will usually be necessary. For most crops, add a general fertiliser a week or so before seed sowing or planting out. You can use growmore (a balanced, general-pupose fertiliser formulation) or, if you garden organically, blood, fish and bonemeal. Some crops will need additional light feeds throughout the growing season, and this is usually best given as a liquid feed. For leafy crops this should be a balanced feed containing equal amounts of all the major nutrients. For fruiting crops, you should change to one that is higher in potash - such as a tomato fertiliser - to improve the quantity and quality of the fruit. Plants growing in containers will be totally dependent on you to supply nutrients. Most growing media contain enough nutrients to sustain five or six weeks of growth, but after that time will need feeding. You can either feed weekly with a liquid feed or add a controlled-release fertiliser to the compost at planting time. Want to know where to find seed of a specific vegetable cultivar?